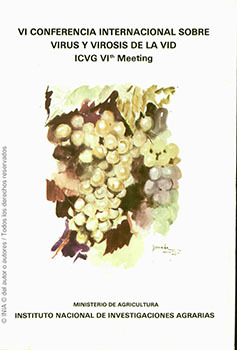 Proceding of the International Council for the Study of the Viruses and Virus Diseases of the Grapevine. Spain 13 – 21 September 1976. Session I: Geographical distribution of virus and virus-like diseases. Session II: New data on known virus diseases. Session III: New viruses of the grapevine. Session IV: Suspected viruses of the grapevine. Session VI: Vectors spread and control. Session VII: Disease control (Heat therapy, tissue culture). Sanitary selection and certification. Physical Description : 374p. ; 17x24; il.